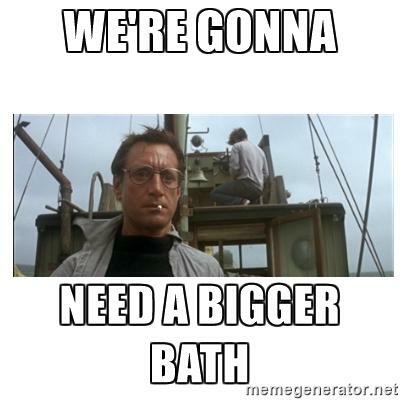 Hot water for bath with no immersion tank? a dish washer heats a few litres of water in a few mins so it might take quite a long time to heat a bath full. Posted: Thu May 19, 16 1:30 am Post subject: Re: Hot water for bath with no immersion tank? Lightweight. Why not a newton pump in the river? I fully understand that electricity is definitely not green for heating. I seem to remember that calorie for calorie, if you heat water directly with a fuel and compare that to electricity created by a fuel (as in gas fired power station) then you get about 30% of the heat you would have done if you'd used the gas directly. However, we've not got main gas. Calor gas is a lot more expensive than mains gas (and I don't want the gas cylinder around either). This is an indoor bathroom, so fire at the tub - nope. We have a multi-fuel stove that doesn't heat water. We had a previous bad experience with a rayburn with a back boiler so didn't want to go that way on the hot water. We had too much hot water, even with the fire shut down and ashed over, on a windy night the system would boil and usually about 2am we had to get up to deal with it, having been woken by the thunder of pipes and the fun sound of steam jetting into the header tank. So our long term plan, is DIY solar hot water. Our short term is having an occasional bath as a treat for sore muscles, with an electric heating system, at least as a top up. Will make a start with heating kettles on the top of the multi-fuel (in winter) and then use the electric shower and then having *something* to finish off, and to keep it warm while soaking. Hence the dishwasher pump idea. Do take on board that it is only for small quantities of water, so maybe not quite so clever after all. If someone can suggest a heater and circulator that is small, that would be really helpful. Small as in fit under a bath. So can fill the bath with warm water (that may or may not be hot enough) and then top up the heating with a little circulating heater. if you have a spare chimney or space for a flue would a "copper" such as found in old style scullerys fit the bill? i can see no reason such a thing could not even be outside so long as the water pipes are insulated and the pump was a little lower than the pot but indoors. for diy an oildrum ,a hose to fill it when needed ,some copper pipe and a few fittings to a bath tap and a small pump would be the basic kit ,add a few bricks etc and it could be very cheap to make. 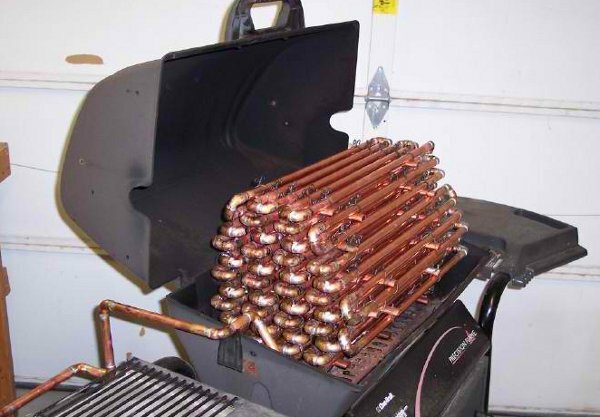 Though on the second one in the barbecue there is the potential for the flame temperature to melt the solder on the pipe joints. Hope it helps the OP though. so long as there is water in the pipes the solder will not melt even if the water turns to steam ,below about 300c it will stay solid although i would not want superheated steam in my bathroom.